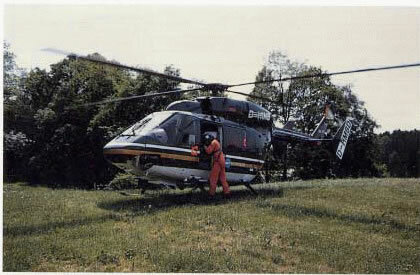 In 1992 several test flights with a color coded thermal imaging camera on a BK 117 were made at Eurocopter Germany. The task was to get first experience of apparent IR-signature of a landscape in top-view from a helicopter. The measurements were made on a research farm with the intention to find a relation between surface temperature and soil moisture. During measurements on a waste deposit a hot spot was found. At present experiments are performed with an additional scanner in the 3-5 µm range mounted parallel to the line of sight (LOS) as the inital scanner with a 8-12 µm detector. Actually an environmental helicopter is in development, which will be equipped with several sensors including a spectroradiometer for the visible and near IR wavelength-bands. 5. At present there are ongoing experiments with an additional scanner (3-5 µm) mounted in the same line of sight as the first camera head (8-12 µm). In an ground measuring campaign different kind of trees were analysed; see chapter 6. The trials will be extended in the future with an helicopter-mounted spectroradiometer (visible and near IR Range) to detect the red-edge effect of chlorophyll. 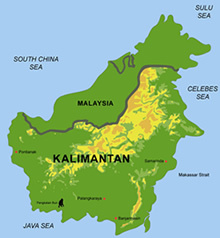 With this remote sensing techniques the crop type, the surface roughness, the growth of vegitation (biomass), evapotranspiration, vitality of plants, vegetation stress etc. can be monitored by thermal imaging systems mounted in helicopters; see chapter 7.